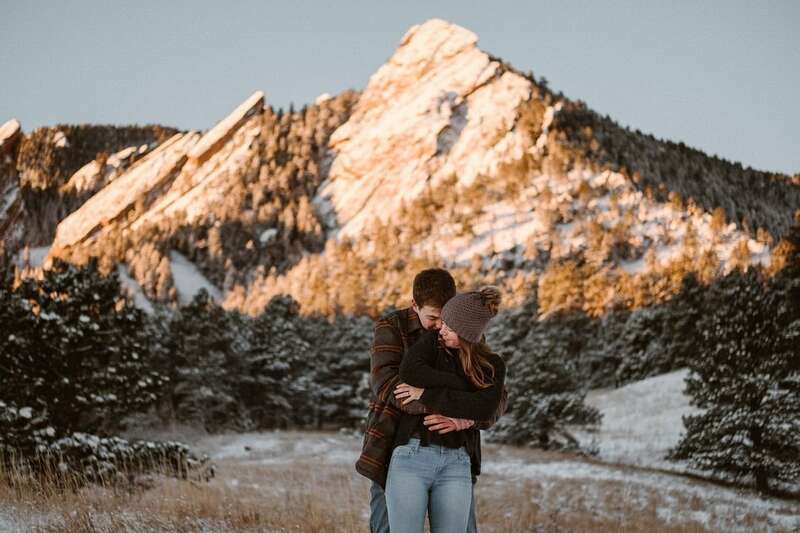 When Victoria and Thomas contacted me to schedule a Colorado winter engagement session, they weren’t sure where they wanted to go. As a RMNP engagement photographer, I suggested that we hike to Dream Lake in Rocky Mountain National Park together. They wanted a shorter hike since the forecast was looking cold, and there are few hikes that give you more incredible views without much milage than Dream Lake! The hike itself is normally easy, but with the recent snowfall the trail had turned into an ice rink. As a RMNP engagement photographer I’m usually prepared for any conditions with my Kahtoola Microspikes, but with this being my first hike of the winter season I had left them at home. Luckily Victoria and Thomas were still up for the challenge, and we slipped our way all the way up to Dream Lake. My favorite part of doing this hike in winter, and especially on a weekday afternoon, is how there are hardly any other people around. When we got to the lake, there was only one other couple there, and it turns out they had gotten married the day before in Minnesota and were in Colorado on their honeymoon! 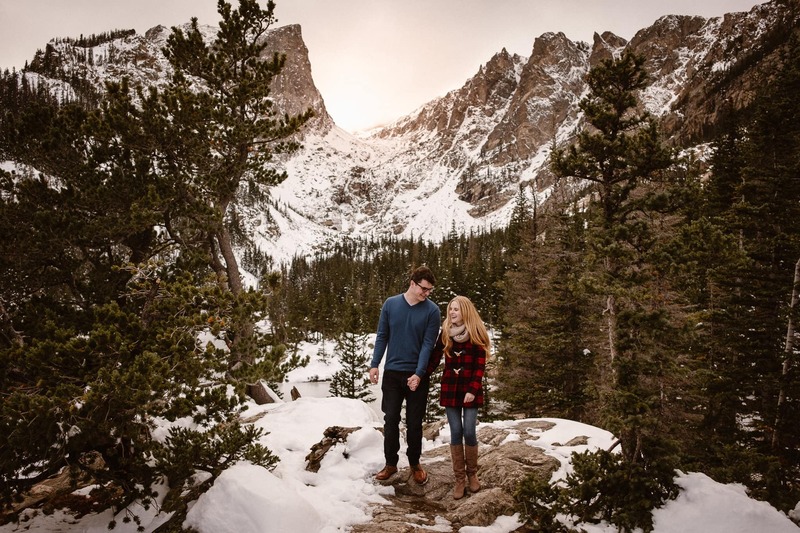 Working as a RMNP engagement photographer really means I get to meet so many amazing people on the trails, and I love getting to know my couples better as we hike together, rather than just jumping straight into photos the second we meet. 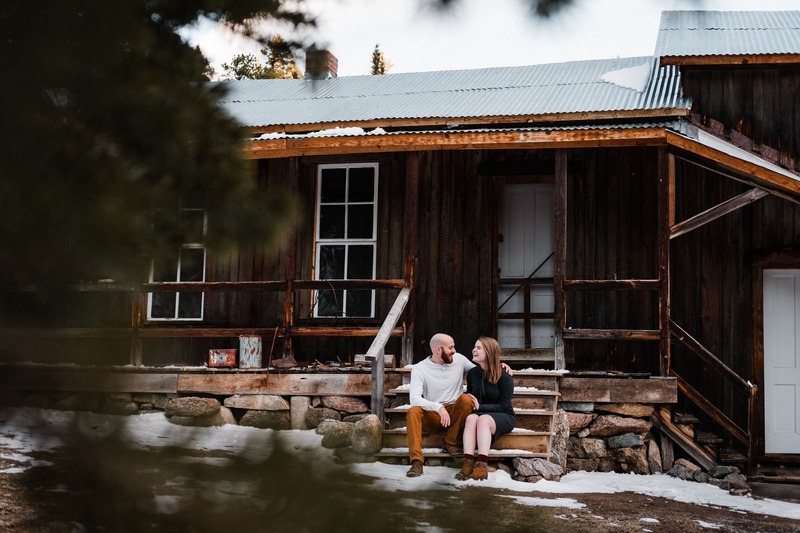 If you’re looking for a RMNP engagement photographer, check out my Rocky Mountain National Park wedding guide, then contact me so we can chat more about finding the perfect hike for you. And if you’re curious what this hike looks like in summer, you should check out Diana and Will’s Dream Lake engagement photos from last year!